IMAGE: Stockbrokers in Mumbai react while trading during the presentation of the Union Budget, February 1, 2018. According to Finance Minister Arun Jaitley's Budget proposal any investor who sells her/his investments after a gap of one year from February 1, 2018 investment date will have to pay 10 per cent LTCG on profits above Rs 100,000. While there was not much for salaried income tax payers in Finance Minister Arun Jaitley's 2018-2019 Union Budget speech, two aspects -- the introduction of 10 per cent long term capital gains tax on equity and mutual fund investors on profits above Rs 1 lakh as well as a standard deduction of Rs 40,000 -- are likely to impact returns and earnings of retail investors and salaried class. 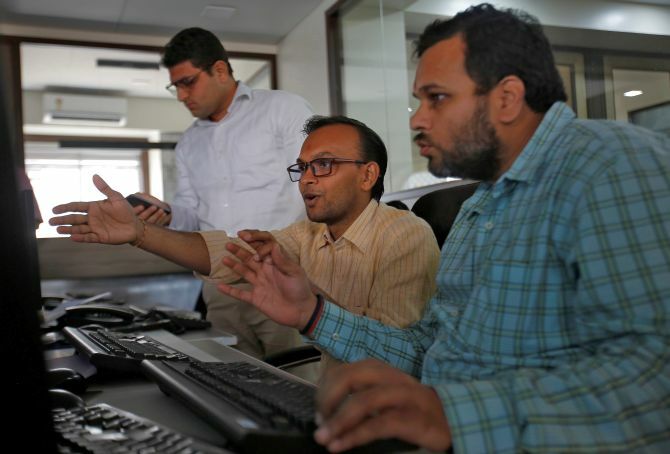 Rediff.com's Prasanna D Zore spoke with tax and investment advisors Mahesh Padmanabhan of Relax With Tax and Anil Rego of Right Horizons to find out the impact these two Budget proposals will have on the salaried class. According to the finance minister's Budget announcement, equity or mutual funds investors will have to pay 10 per cent long term capital gains tax on profits above Rs 100,000. "Two scenarios arise here," says Rego. "Those who have invested on or before January 31, 2018, and, those who have invested on or from February 1, 2018." According to Jaitley's Budget proposal any investor who sells her/his investments after a gap of one year from February 1, 2018, as the investment date, will have to pay 10 per cent LTCG on profits above Rs 100,000. Explains Padmanabhan: For example, if you have invested say Rs 500,000 on February 1, 2018 and if this investment has given you a profit of Rs 120,000 (remember, only profits over Rs 100,000 will be taxed as per the announcement made by the FM) after February 1, 2019 (any time period over 12 months is considered long term and such profit becomes long term capital gain), then you will have to pay 10 per cent tax on the Rs 120,000 profit you have made on your investment. This 10 per cent tax on Rs 120,000 works out to Rs 12,000. However, if you were to sell your investment before one year of your investments, then short term capital gains tax of 15 per cent, as it existed before, will be charged. "Which means, if you bought shares or mutual fund units worth Rs 500,000 on February 1, 2018 and this investment turns a profit of Rs 120,000, say on January 1, 2019 (in less than 12 months), and if you want to sell it for some reason, then you will be paying 15 per cent STCG on Rs 120,000 profit you have made," adds Rego. A 15 per cent tax on Rs 120,000 profit works out to Rs 18,000. Thus, the difference between the LTCG/STCG you pay now will be only Rs 6,000 (the difference between the LTCG of Rs 18,000 and STCG of Rs 12,000) made under the new rule if you were to liquidate your investments within 12 months of your investment. "So, the differential between capital gain tax you pay as short term or long term investor is not much now. This 10 per cent LTCG does not convey the right message," says Rego. "Retail investors, especially MF investors, are not big ticket, smart, traders to make a quick buck and move out by taking advantage of the small differential between the LTCG (of 10 per cent now) and STCG (of 15 per cent now as well as earlier)," says Padmanabhan. Supporting his argument, Rego says that introduction of the 10 per cent LTCG, in addition to the already existing securities transaction tax, is like adding a double tax on the money made by investors. Is 10 per cent LTCG fair? "The reason being you have to pay the STT, which in the first place, replaced long term capital gains tax that existed before the introduction of STT. Introducing STT to replace LTCG was a good move because it encouraged investors to save for the longer term and penalised, in a way, short term traders who had to pay more in terms of the STT," says Rego. "This tax was also easy to levy as it got deducted at the exchange level. The ideal thing the government could have done was to increase the STT marginally instead of introducing the LTCG," adds Rego. "However, this would only marginally impact retail mutual fund investors entering the market because today people go after returns and won't mind paying a 10 per cent tax on their profits," says Padmanabhan. Rego strongly believes that the introduction of LTCG will not help achieve the desired objective (of increasing the tax revenues for the government). So, what happens to those investments made on or before the cut-off date of January 31, 2018? "The fair market value as on January 31, 2018 will be taken as your cost of acquisition for taxation purpose. So, whatever gain an investor has made till this date will be exempted from LTCG tax for this year," says Padmanabhan. Rs 40,000 standard deduction: What's your gain? "This is just more of hawa (thin air, nothing substantial)," says Padmanabhan. "Even today Rs 19,200 is exempted for transport allowance (the maximum one can get as exemption under this head) and Rs 15,000 was allowed as medical reimbursement. If you add this two the total comes out to Rs 34,200. So, what you gain effectively is Rs 5,800 (Rs 40,000 minus Rs 34,200)," Padmanabhan points out. Rego echoes Padmanabhan's views, adding, "The only good thing is people will not be required to maintain their medical bills and invest time in that. For employers too this means less headache."